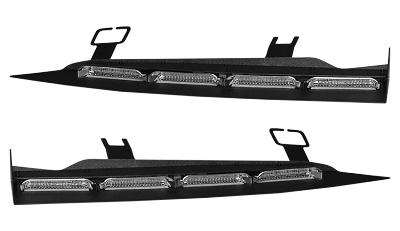 The Eclipse Interior Light Bar features high-powered LED's behind the new Tidal™ optics. Once installed, the incredibly low profile (just under 1 inch) reveals more headroom for taller drivers while also providing a more expansive field of view. The Eclipse uses a vehicle specific housing and bracket system to ensure a tight, secure fit with little or no flashback to speak of. Available in dual color as well.